The fourth largest of Italy's northern lakes lies 20 km north-west of Brecia at an altitude of 180 m. Fed by the River Oglio, it is 25 km long and 251 m deep. In the middle of the lake is Monte Isola, Italy's largest lake island. While the road along the western shore leads past steep cliffs offering spectacular lake views, the main towns are situated on the eastern shore, which is dotted with ancient fishing villages with Romanesque churches and lakeshore promenades in the shade of palm trees. In spite of its excellent infrastructure, Lago d'Iseo is not as tourist-plagued as nearby Lake Garda and Lake Como. This provincial capital situated between the lakes of Iseo, Idro and Garda was declared a UNESCO World Heritage Site for good reason. 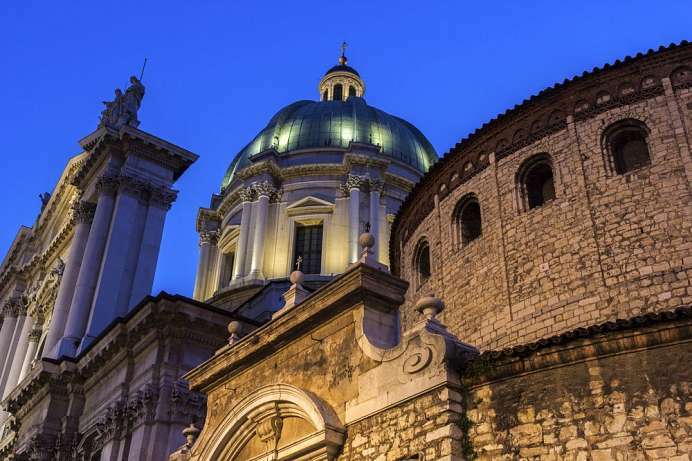 There can hardly be a comparable city whose history is as completely documented by its architectural monuments as Brescia. The historic city center features streets dating back to Roman times, as well as a Roman shrine dating to the days of the Republic, a Capitoline temple and a Roman theater. The Lombards arrived later during the Migration Period and left behind the monastery of Santa Giulia, which now houses the city museum. Shops, bars and restaurants can be found in the streets surrounding the Piazza della Loggia and there is a weekly market in the city center every Saturday.